History of Western letters integrating calligraphy, epigraphy and printing. Undated spread from notebook by Michael Harvey. Scan courtesy of Michael Harvey. Last year (27 March 2012) Imprint published an interview I conducted with my longtime friend Michael Harvey, the triple-threat lettercarver/jacket designer/type designer. After it was posted I continued to email Michael with the intention of publishing an addendum to the interview. Unfortunately, after a month or so our conversation petered out as we both became absorbed in other things. In memory of Michael, who passed away on October 18 at the age of 82, I am publishing the remaining portions of our conversation. Paul Let’s restart our conversation by talking about the people you have worked with over the years. To begin with, can you describe what it was like to work for Reynolds Stone? What sort of work did you do for him and what sort of person was he? What did you learn from him? Michael Reynolds Stone’s ancestor was Sir Joshua Reynolds, whom he was named after. Educated at Eton, studied history at Cambridge, making meticulous models of sea-going barges in holidays at West Bay, where he got to know the skippers. His skills led to wood engraving. His cousin, Will Carter, gave him commissions he could not handle—much demand for memorials after WWII. Reynolds preferred wood engraving, so needed an assistent to carve memorials. I joined him in 1955. Reynolds was surprised that I expected to be paid. In his world, fathers supported their sons until they were 28! He agreed to pay me one quarter of his fees. At the start, he laid out inscriptions on the slate in white watercolor, did a lot of pencil scribbling to correct spacing, then I began cutting. The ﬁrst job was a large table tomb, one side six feet long, two end panels about four feet square. The job took three months to complete, and I earned £50. Later on I was allowed to layout inscriptions myself following Reynolds’ drawings. I spent six years with Reynolds, during which time he taught me nothing directly. But he had a huge library, including all the Fleurons, which he would let me borrow, so I absorbed most from books rather than from Reynolds himself. I carved letters in the old stables, while Reynolds engraved them on boxwood in the Old Rectory, a splendid early 18-century building. We met for midmorning coffee and to read the papers. Later he would come out to the stables to check on my work. Once he thought my letters where too bold so I had to start again on a new piece of slate. Slate was his favorite material; the ﬁnest letters could be cut in slate, the nearest thing to boxwood. He liked the effect of light letters on a dark background. 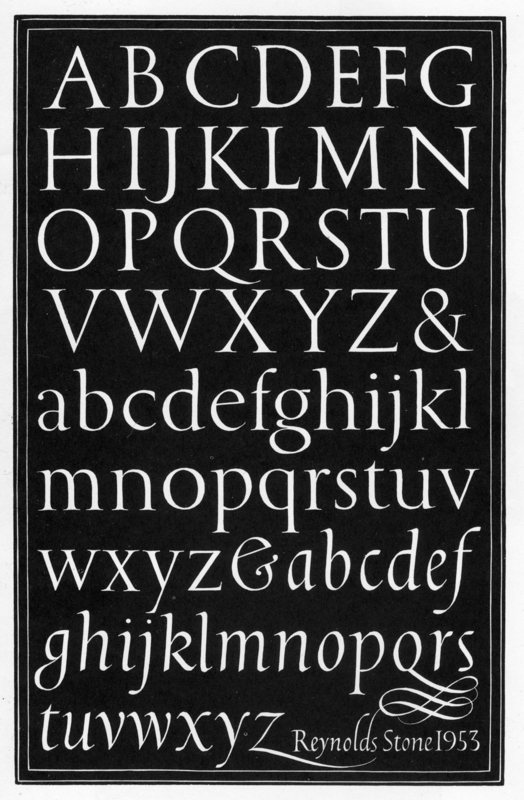 Wood engraved alphabets by Reynolds Stone (1953). With the kind permission of Humphrey Stone. As a man, Reynolds was very modest, liked working at home, didn’t like going to London. His mentor, Stanley Morison, liked living in the city, had no time for the country but loved trains, so could be lured down to visit Reynolds by the three-hour train ride to West Dorset. Before it was fashionable to like Victoriana, Reynolds collected nineteenth-century books, admired William Morris patterns. I liked Scandinavian fashions so didn’t go for Reynolds’ taste in interiors. Reynolds Stone was a gentleman who loved the past, while I had no time for the past! 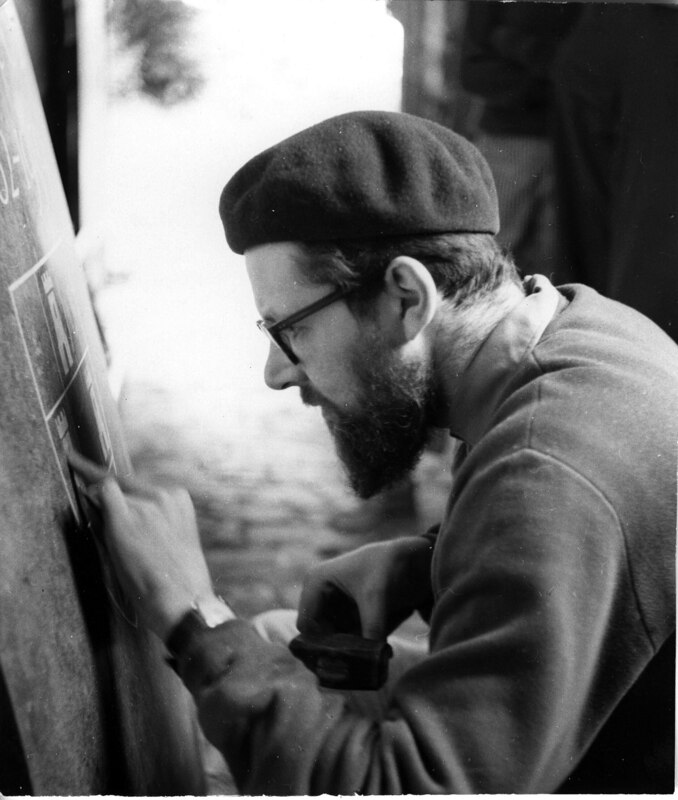 Michael Harvey carving letters during his time with Reynolds Stone at the Old Rectory (c. 1955). The hat is an homage to Eric Gill. Photograph courtesy of Michael Harvey. Paul Once you left Stone and went freelance you said earlier that you began doing jackets for Methuen and other publishers. Are there any individuals at those ﬁrms who became longtime clients/patrons? Or did John Ryder and Ian Bain come along later? Did you work with George Mackie? These men are virtually unknown to Americans and I am sure that is also true for younger designers in general. Can you provide portraits of these men? What sort of work did you do for them? How much did they direct you or leave you alone? Were you paid better than with Stone? Michael I began designing jackets in 1957, didn’t meet John Ryder until 1964. Before then I was commissioned by several publishers, given quite a free hand. I soon learned how to please very diverse companies: some academic, others with religious or ﬁctional lists. None of these art directors inﬂuenced me. Because I produced work on time most continued to use me. One client I recall was Diana Athill at André Deutsch, a superb editor responsible for bringing some American authors (Philip Roth, Norman Mailer) to English readers. Now in her mid-nineties she is still being published both here and in the US. John Ryder was a quiet man, art director of The Bodley Head and devoted to books and type. He carried on a correspondence with Paul Standard. Ryder drew my attention to type, commissioning two typefaces for the company. As for jackets, he had me draw very condensed type characters—condensed letters are very useful on book jackets. He also restrained my graphic playfulness somewhat. A friend recently wrote: “In Terry O’Donnell’s research (held at the Crafts Centre, Farnham), I see John Ryder was very nice about you: ‘Michael Harvey needs restraining sometimes, but he‘s about the best’ (!)”. It is good to know people whose taste you repect. “What would John make of this?” was a regular question. Iain Bain’s, too. Iain is a book man through and through, an expert on all kinds of books, and the authority on the wood engraver Thomas Bewick. As with Reynolds Stone, I absorbed so much from these men in terms of taste and knowledge. In the early days, the fee for a jacket was 10 guineas (Chatto & Windus had me sign away my international rights!). Cambridge University Press paid 15 guineas. Over the years fees rose to £25, still modest considering that a jacket took a day and a half: a rough or two (I tried to get roughs down to one to stop publishers asking for a third), then artwork drawn in a day. I think even these modest sums were more than Reynolds paid. From 1961 I was teaching part-time at Bournemouth art school, which brought in regular money. Paul Was Ian Bain an art director or designer at a publisher or was he an independent book designer? Who did you work with at Cambridge University Press? Since this was still the era of metal type was your artwork made as mechanicals and then converted to zincos or photoengraved blocks? How did the new technologies of Letraset and phototypesetting affect your work at that time? What classes did you teach at Bournemouth? Are there any students of yours from those days who went on to notable careers? While you were doing jackets and teaching at Bournemouth had you begun to do lettercutting on your own? Michael Iain Bain was originally a publisher’s rep, but became production manager at The Bodley Head under John Ryder. Finally, Iain became publicity director of The Tate Gallery. He still takes on the design of lavish books of ﬁne prints. After John Dreyfus introduced me to the Cambridge University Press [CUP], commissions came in the post from Michael Black and John Trevitt. Others who did jackets for the press included Cambridge resident and ﬁne letter carver Will Carter. I just supplied mechanicals—such a strange term!—with color samples, letting the press do the rest. Letraset? I had the ﬁrst versions where one ﬂoated letters on water. For CUP I sometimes used rubdown Letraset for small captions, sometimes type photographed and stuck in place. At Bournemouth I taught lettering, set students design tasks, such as using letters to express a book’s contents, logos, signage and so on. I’ve loss track of my students, except for Richard Healy who for a time was my assistant, a ﬁne letter carver, wood engraver. He has written for Matrix and Parenthesis, a journal published alternatively in the US and the UK. Yes, I was carving inscriptions for clients while teaching at Bournemouth. I was part-time, two or three days a week. Income from teaching kept us afloat. This is where our conversation unfortunately trailed off. I had planned to ask Michael about his design of Zephyr for Ludlow Typograph, his designs Ellington and Strayhorn for Monotype Corporation, his Fine Fonts business with Andy Benedek, details of his love of jazz, bicycles, photography and single malt Scotch, and—especially—his longtime relationship with the Scottish poet Ian Hamilton Findlay. I regret the opportunity missed, but am glad that I at least captured some of Michael’s reminiscences for posterity. Reynolds Stone (1909–1979) was an engraver, lettercarver, type designer and painter. 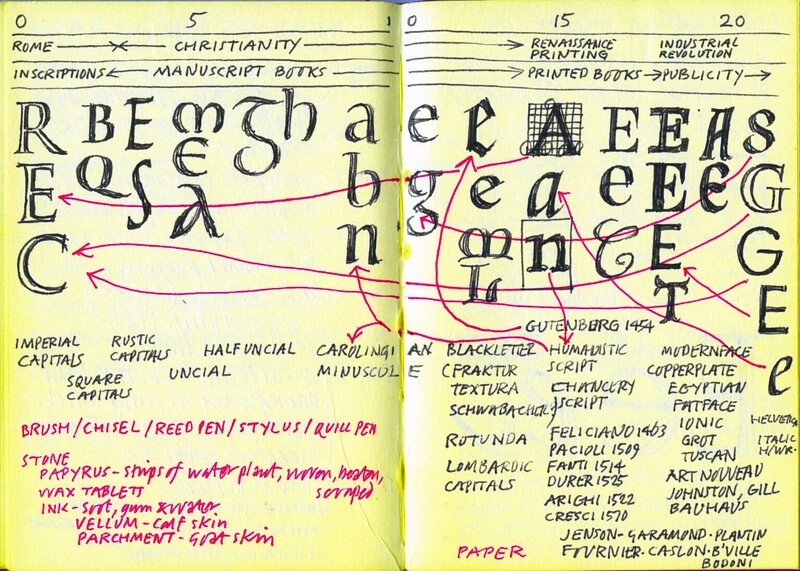 Will Carter (1912–2001) was a printer, lettercarver and type designer. John Ryder (1917–2001) was a book designer, private press printer and author. Stanley Morison (1889–1967) was an advisor to Monotype Corporation, Cambridge University Press and The Times of London. He wrote extensively on type design, typographic history, calligraphy and lettering history. He is credited with the design of Times New Roman. Paul Standard (1897–1992) was a publicist for Canadian Paciﬁc Railroad, an author, calligrapher and teacher. He wrote extensively on calligraphy and on ﬁgures in the worlds of calligraphy, type design and graphic design. Ian Bain is a book designer and printing historian. Bournemouth Municipal College of Art merged with the Poole College of Art in 1964. Between 1980 and 1912 the school changed its name several times. It is now Arts University Bournemouth. The Bodley Head was a British publisher established in 1887. It was acquired by Random House in 1987 and ceased as an adult imprint in 1990. Chatto & Windus is a British publisher established in 1855 and acquired by Random House in 1987. The Fleuron (1923–1930) was a journal of typography and the book arts established by the Fleuron Society. Its seven volumes were edited by Oliver Simon and Stanley Morison. Matrix: A Review for Printers and Bibliophiles has been published since 1982 by The Whittington Press. Parenthesis is the journal of the Fine Press Book Association. It has been published since 1998.